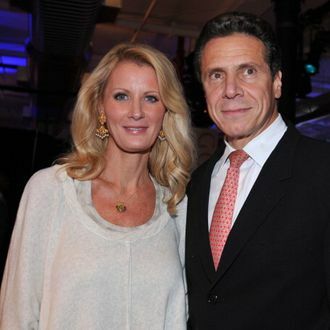 Governor Andrew Cuomo’s girlfriend, Food Channel personality Sandra Lee, does not like being asked too much about her boyfriend. But that doesn’t necessarily mean she doesn’t want to talk about him, or a fictional version of him, as The Wall Street Journal learned in an advance copy of Lee’s first novel, The Recipe Box. And that fictional version comes bearing a ring. The book is all about a romance between Grace D’Angelo, a “Midwesterner who adores cooking, works in TV and dotes on the family pet, a beloved white cockatoo,” and Mike Lund, “a ‘muscular’ teacher and volunteer firefighter with ‘curly brown hair and deep gray eyes.’” And though the names and identities are changed, the story is peppered with details ripped from Lee and Cuomo’s life together. The cockatoo, for example, is real, the Journal points out. Cuomo gave Lee such a bird as a present in 2011. And the whole “muscular” description sure fits in with Lee’s early description of Cuomo as a “huge, musclebound man.” Lund is super into motorcycles and muscle cars, as is Cuomo, and he’s a big outdoorsman, like the governor. There’s plenty to differentiate them, of course, including the fact that in the book, Lund proposes to D’Angelo and she accepts. Sure, they’re just fictional characters, but it’s almost impossible not to read into them the biggest hint ever dropped.